The main purpose of our Rim Straightening Machine HRS-370 is to repair the rim efficiently without wasting time and money. On damage of the wheel rim, user does not have to replace the entire wheel rim rather the rim can be repaired. Our Rim Straightening Machine HRS-370 is available along with a hydraulic Jack attachment for better performance. 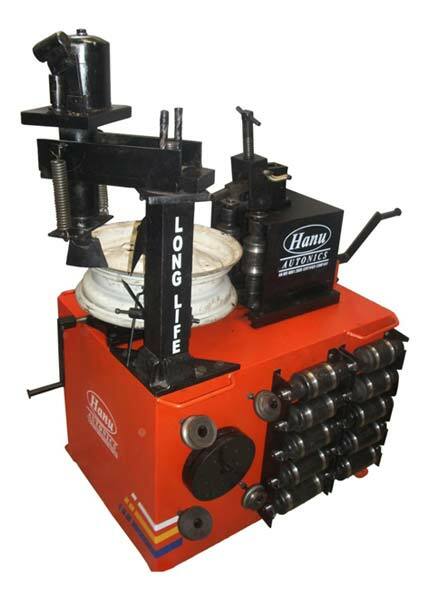 Rim Straightening Machine HRS-370 has double Dies at the center that remove bends of heavily damaged rim accurately at corners and the hydraulic jack attachment is able to remove most of the middle bends from the rims. Bends in heavily damaged rim can be removed & straightened accurately with the help of our Rim Straightening Machine HRS-370. To meet the different needs of clients, we provide Die attachment of 3.5”, 4”, 4.5”, 5”, 5.5”, 6” and 6.5” rim width, in pairs along with our Rim Straightening Machine HRS-370. Other than that 2 no of bottom die for lower collar and 5 no of top dies for upper collar of Rim are offered with our Rim Straightening Machine.